Three Distinct Ways to Celebrate the Royal Wedding in L.A.
Home Celebrity 3 Distinct Ways to Celebrate the Royal Wedding Day in L.A.
Los Angeles native Meghan Markle is marrying the U.K.’s Prince Harry this Saturday, and, given the local connection, L.A. is ready to celebrate the Royal Wedding in style. Something to keep in mind while chatting over tea this weekend: While Markle is marrying a prince, her title, which the Queen will hand down after the wedding ceremony, is predicted to be Duchess of Sussex, not Princess Meghan. Similarly, her soon-to-be sister-in-law, Kate Middleton, was titled Duchess of Cambridge because only women born into the royal family are referred to as princesses under their own names. But, come on—she’s Princess Meghan to us. Even though the celebrations at Windsor Castle take place half a world away—and at an ungodly hour for those of us here in the Pacific time zone–there are still a few ways to watch and feel like you’re part of the historic day. We selected three local events that run the gamut from populist pub revelry to a luxe weekend retreat that’s more Marie Antoinette than People’s Princess. The announced schedule has the royal wedding starting around 11:15 a.m. local time—which means if you want to watch a live stream, you’ll need to tune in at 3:15 a.m. here in L.A. One of the few places that will be opening up to show it as it happens is English-style pub Cat & Fiddle. The night starts with a happy hour from 11 p.m. until the bar closes up for the night, after which you’ll need a slumber party ticket to stay around. From then on, the night continues with a special pub quiz hosted by Craig Young from Spilling Royal Tea, costume contests (either slumber party jammies or royal-style fascinators will qualify), and, as it gets closer to dawn, sausage rolls, scones, and other English breakfast snacks, all leading up to the grand entrance at St. George’s and the subsequent procession through Windsor. Note: Even though the setting is a pub, all ages are welcome to attend since since it’s technically a private event after bar-service hours. If you consider “afternoon tea” to be the epitome of British-ness, you have the Langham to thank for that. Our idea of the elegant snack time wasn’t really a big thing until the Langham Hotel opened in London in 1865 and set the trend that continues to this day. Wedgwood even made the hotel chain its very own china pattern, a rose floral design, which seems very on-point for the Royal Wedding. 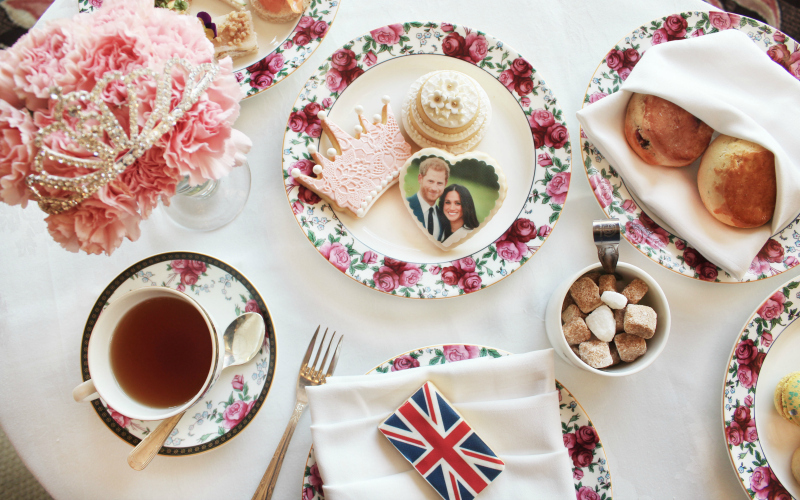 Enjoy your biscuits and tiny sandwiches on those dainty plates at the Langham Huntington in Pasadena from 10 a.m. to 4 p.m. on Saturday, when the event will be all Meghan-and-Harry themed. Recorded footage of the ceremony and processional will be re-broadcast on screens around the Lobby Lounge. Maybe the Royal Wedding is inspiring you to opt for a wildly luxurious weekend. The Viceroy L’Ermitage hotel in Beverly Hills has a special package that should indulge every whim of your own inner royal. Included in the offer is lodging in the hotel’s Presidential Suite for two nights, a chauffeur driving you around in a Mercedes Maybach, Dom Perignon Champagne, gold facials for two, ruby gemstone couples massages, over-the-top meals and wines, afternoon tea served by your own private butler, and a special live in-suite viewing of the wedding, complete with hand-delivered themed treats. And if the price for all this easily exceeds what the average couple spends on their own actual wedding, well, they do say it’s good to be queen. RELATED: The Essential Spots for Afternoon Tea in L.A.